A Sampler of Animating Kids Recipes from our White Hat, Yellow Hat, Red Hat and Blue Hat levels. Our Top Ten Secret Recipes for Beginners. A PDF with Downloadable Animation Formulas and Fun Characters! 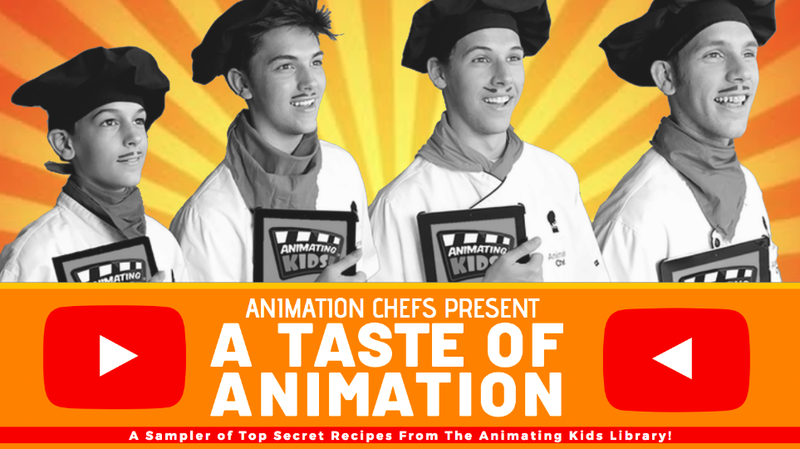 Clickable links to Video Demonstrations by the Animation Chefs! Digital Access White Hat, Yellow Hat, Red Hat Secret Recipes. Beginner, Intermediate and Advanced Animation exercises with step-by-step video demos modeled by the Animation Chefs. Over 70 pre-planned animation lessons with downloadable instructor guides and secret recipe sheets. 140+ Pre-planned Secret Recipe Demonstrations with over 5 hours of video tutorials and professional development. • White Hat - Beginners Level • Yellow Hat - Special Effects • Red Hat - Acting • Blue Hat - Production Process • Black Hat - P.D. & Case Studies 1-on-1 Live Coaching on Customizing Animating Kids for Your Site.